Melanoma is scary. Really scary. But, as cliché as it may sound, knowledge is power. Knowing a little bit more about melanoma – its red flags, or how its appearance differs from that of an ordinary mole, for instance – may actually alleviate some of the fear surrounding it. More importantly, this knowledge may help save a life – maybe yours. What is a “Normal” Mole? A common mole develops when pigment cells called melanocytes grow in clusters due to genetics. These growths typically appear above the waist on areas exposed to the sun. Seldom do they grow on the scalp, breast, or buttocks. Most adults have between 10 and 40 common moles. Although they may be present at birth, most common moles tend to appear later in childhood at school age. Most of us continue to develop new moles until about age 40. Amazingly, these moles often fade as we advance in age, or as I like to say, as we become wiser. The synonym for common mole is nevus. The plural is nevi. Typically, a common mole is smaller than five millimeters wide (about 1/4 inch, the width of a pencil eraser). It tends to be symmetric, meaning it is round or oval, dome-shaped, and has a smooth surface with a distinct edge. And a common mole usually has an even pigment of pink, tan, or brown. People who have dark skin or hair usually have darker moles than people with fair skin or blonde hair. 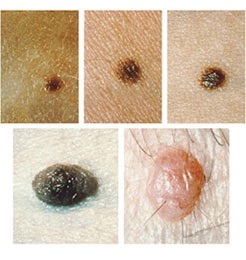 Examples of common moles. 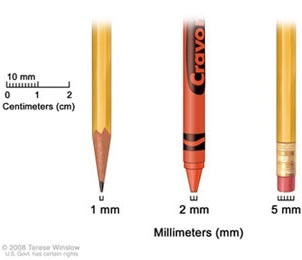 The mole at the upper left is 1 millimeter in diameter (the width of the tip of a sharpened pencil), and the other moles in the upper row are 2 millimeters in diameter (the width of the tip of a new crayon). The moles in the second row are slightly larger (up to 5 millimeters in diameter, which is the width of a new pencil eraser). 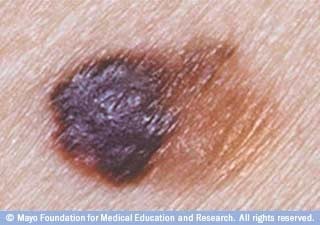 Can a Common Mole Turn Into a Melanoma? Yes, but this is a rare event. A phenomenon exists, however, in that people with more than 50 common moles have an increased chance of developing melanoma. The mole gets unevenly smaller or bigger (unlike normal moles in children, which get evenly bigger). What is an Abnormal Mole? An atypical mole, or dysplastic nevus, is a type of mole that is genetically mutated and usually appears so. Most often, it stands out among other moles and lacks symmetry within itself. It may be bigger than a common mole, and its surface, border, and color may be unusual. 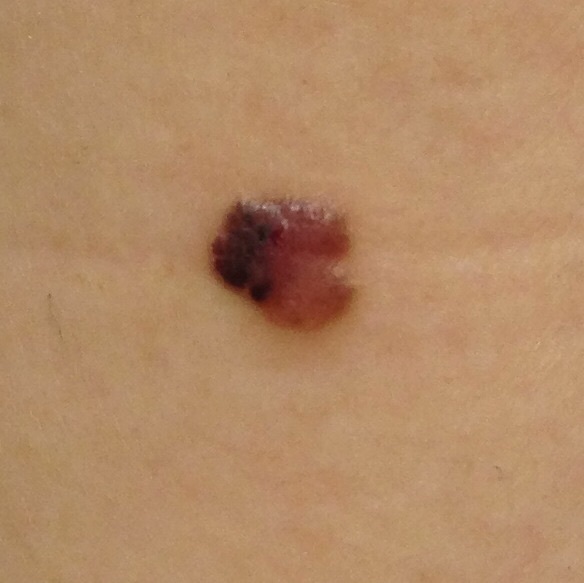 Generally, a dysplastic nevus is more than 5 millimeters wide (1, 3). It can be monochrome or have a mixture of several colors, from pink to dark brown. Most often, it is flat with a smooth, slightly scaly, or pebbly surface, and it has an irregular edge that may fade into the surrounding skin. 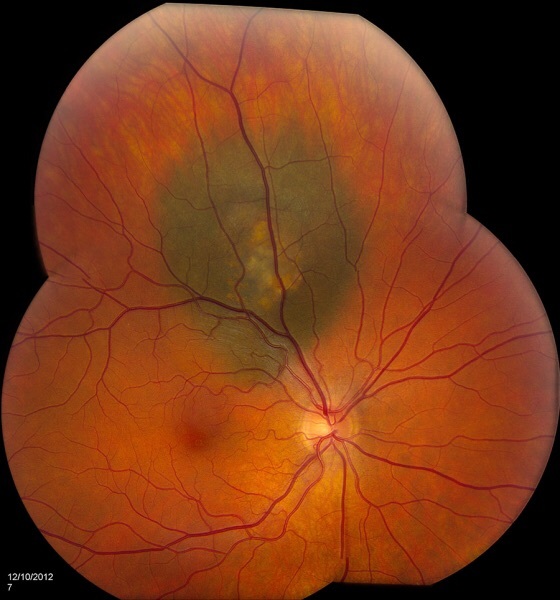 The human eye, even a trained one, cannot definitively differentiate a dysplastic nevus from a melanoma. 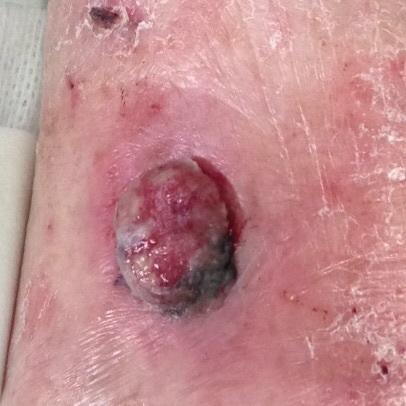 Pathology from a biopsy or excision of a lesion determines its diagnosis. 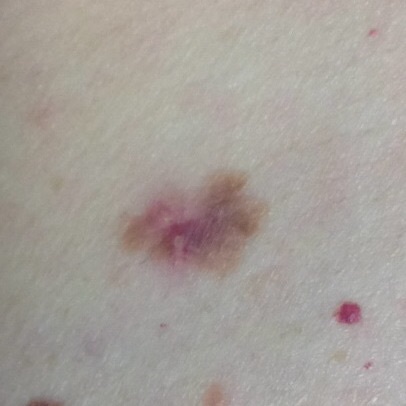 A dysplastic nevus may occur anywhere on the body, but it is usually seen in areas exposed to the sun, such as the back. It may also appear in areas not exposed to the sun, such as the scalp, breasts, and below the waist. 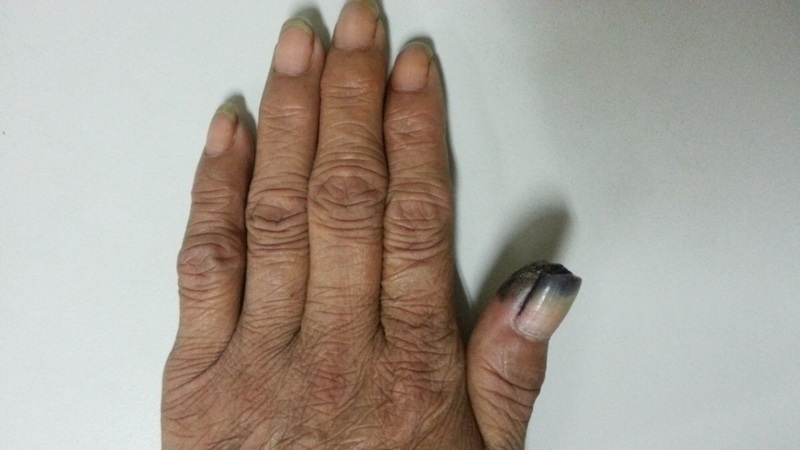 Some people have only a couple of dysplastic nevi, while others have more than 10. People who have multiple atypical nevi frequently have an increased number of common moles, as well. The vast majority remain stable over time. However, someone with more than five dysplastic nevi is about 10 times more likely to develop melanoma than someone with none. It makes sense then that the more atypical nevi, the more potential for melanoma. 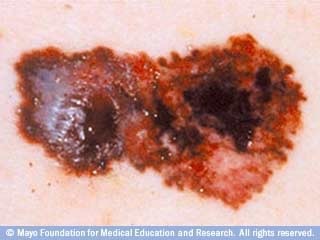 Melanoma starts in the melanocytes. As melanoma develops and advances, most of these cells continue to produce melanin. This is why melanoma tumors are often dark brown or black. But it can also appear pink, tan, or even white, which may make the tumor elusive; it may resemble a common mole or simply be difficult to spot on the skin. While most cases of melanoma begins on the trunk (chest or back) in men and on the legs of women, it can start anywhere on the skin. It can even start in a mucous membrane or an eye, although this is exceedingly rare. Darker skinned persons have lower risk of melanoma, but, contrary to popular belief, they most definitely can get melanoma. Fortunately, with today’s treatments, melanoma can almost always be cured in its early stages. But if not caught “early,” which is impossible to define because progression rates vary from weeks to years, it is likely to metastasize, or spread to other parts of the body through the lymphatic system. Skin cancer is the most common of all cancers. Although melanoma accounts for less than 2% of skin cancers, it has proven most lethal, causing most skin cancer related deaths. While melanoma cases continue to rise, so do survival, or cure, rates. At an early stage, before it spreads to a lymph node, there’s a 98% cure rate. Once it hits a lymph node, this figure drops to 63%. With organ involvement (stage IV), only about 10% are cured. Melanoma is on the rise in the US, which has been the case for at least 30 years. This is striking to me given that we’ve advanced in preventive and treatment measures. Overall, the lifetime risk of getting melanoma is an estimated 1 in 40 for whites, 1 in 1,000 for blacks, and 1 in 200 for Hispanics. However, it’s important to stress that an individual’s risk depends on other factors. Tanning: Although having skin that tans well lowers the risk of sunburn, even people who tan well without burning increase their chance of melanoma by spending time in the sun without protection. UV radiation from artificial sources, such as sun lamps and tanning booths, can cause skin damage and melanoma, particularly exposure before age 30. One’s risk is higher if he/she has a family history of melanoma in a first-degree relative (parent, brother, sister, or child). Having a personal history melanoma or another skin cancer also heightens one’s risk. People who have weak immune systems, such as organ transplant patients and people infected with HIV, have an increased risk. 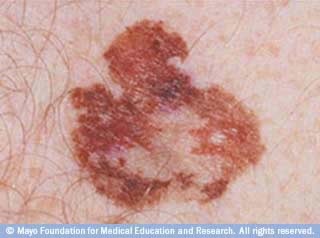 Melanoma is more common in older people, but it is also found in younger people. In fact, it is one of the most common cancers in people under 30. Generally speaking, in the US, the male gender is more at risk, but this varies by age. Before age 45, the risk is higher for women; after age 45, the risk is higher in men. For instance, some antibiotics, hormones, or antidepressants make skin more sensitive to the sun or suppress the immune system, both of which increase the chance of melanoma. People with this rare, inherited condition have a high risk of any type of skin cancer at a young age. The most important warning sign is a new spot on the skin or a spot that is changing in size, shape, or color. A spot that looks different from all of the other spots on your skin can also be a warning. In this instance, if you can’t seek medical attention promptly, you might want to take good close-up photos of the area so your provider can appreciate any changes once you do get an appointment. • B is for Border: The edges are irregular, ragged, notched, or blurred. • C is for Color: The color is not the same all over and may include shades of brown or black, or even pink, red, white, or blue. • D is for Diameter: The size changes, generally grows. It is more than five millimeters or 1⁄4 inch wide. • E is for Evolving: The mole is changing in size, shape, or color over weeks to months. Many in the dermatology field refer to this as the “ugly duckling” phenomenon. *Some melanomas are elusive and don’t have any of these characteristics. Hence the importance of (at a minimum) an annual full skin exam by a dermatology specialist.